Are you looking for a non-invasive, medical grade, and scientifically advanced treatment for beautifully hydrated and toned skin? If so, then look no further than Prescott DermaLift! Skin is most beautiful and radiant when it is healthy and hydrated. The focus of medical grade facial care is to restore skin to its healthiest state by removing impurities and replenishing essential nutrients. Environmental pollution, toxins, wind and sun rays can cause undetectable skin damage that adds up with time. The natural aging process also plays a role in decreased skin health, with reduced collagen production, reduced cellular turnover and dehydration. This combination can yield damaged skin with poor skin tone and texture. Prescott DermaLift has the key to healthy looking skin that is bright, even and glowing, see the difference in just one session! We offer non-invasive facial treatments that deliver real results without irritation or downtime. 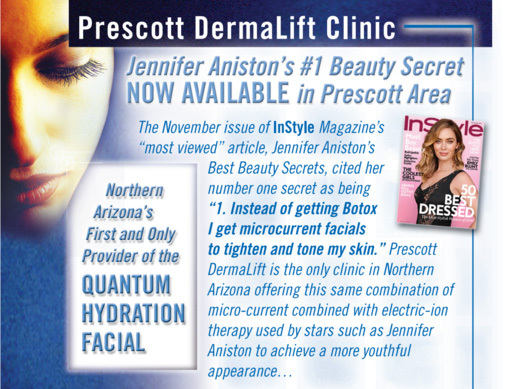 For more information how you can have heathier skin, contact us or call 928-713-6907 to schedule an appointment today! Prevent the aging process. Restore any alterations of the skin. Results from the very first visit. Exclusive therapies to apply, according to your needs.